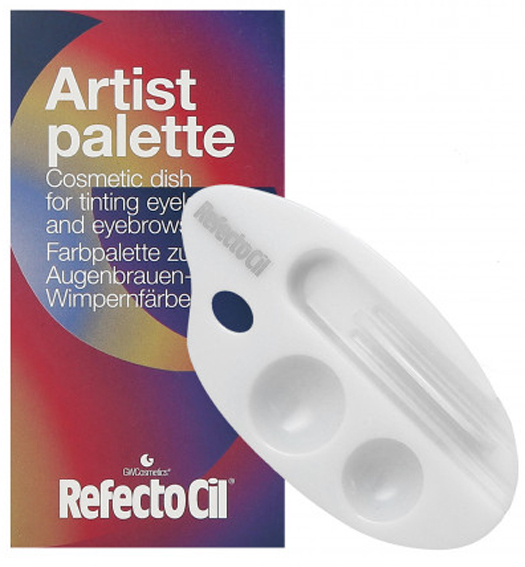 RefectoCil Artist Palette is a practical and at the same time elegant cosmetic dish for tinting eyebrows and eyelashes. The two compartments enable you to compound the eyelash and eyebrow tint at the same time. Two grooves for resting your application sticks and/or brushes guarantee clean working. The RefectoCil Artist Palette makes efficient and comfortable working possible. Convenient for right and left handed. * For Professional use only. RefectoCil Artist Palette is a practical and at the same time elegant cosmetic dish for tinting eyebrows and eyelashes. The two compartments enable you to compound the eyelash and eyebrow tint at the same time. Two grooves for resting your application sticks and/or brushes guarantee clean working. The RefectoCil Artist Palette makes efficient and comfortable working possible. Convenient for right and left handed. * For Professional use only.